Nick Ziobro is a 17 year old vocal sensation taking the pop/jazz world by storm - hailed by the New York TImes as possessing "an easy, swinging confidence and charm that suggests he could evolve into another Michael Bublé”. 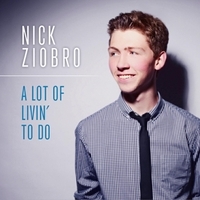 Nick Ziobro, the 17 year-old pop/jazz vocal sensation, will release his debut album A Lot of Livin’ to Do on Tuesday, May 20. The new disc, produced by Michael Feinstein – the two-time Emmy and five-time Grammy Award-nominated vocalist, pianist and musicologist – and available through Titanium Entertainment, will be available in stores and digital outlets such as iTunes and Amazon.com. The album’s debut single “This Guy’s In Love with You” is now available on iTunes. The dynamic new collection of classic standards from the Great American Songbook and beyond features Nick’s sensitive interpretations and invigorating arrangements by Tedd Firth. Nick, who has been hailed as “a budding young talent” by LA Weekly and praised for his “dreamy phrasing and perfect pitch” by Rex Reed in the New York Observer, will perform a special CD release concert at Birdland Jazz Club (315 West 44th Street in Manhattan) on Thursday, May 22 at 6:00 PM. A Lot of Livin’ to Do features an impressive lineup of jazz veterans including Musical Director Tedd Firth on piano, Bucky Pizzarelli on guitar, Jay Leonhart on bass, Ray Marchica on drums, Brian Pareschi on trumpet and flugelhorn, and Marc Phaneuf on saxophone and clarinet. The album has liner notes by Michael Feinstein and color photography by Shervin Lainez (Sara Bareilles, Melody Gardot, Sandra Bernhard). The dazzling opening title track – taken from the musical Bye Bye Birdie – captures Nick’s unique phrasing with its sprightly and sophisticated arrangement. Other highlights include “All of Me,” an inviting swing number that has major significance to Nick. “This song has been with me since I first started singing this music,” he said. “When I was eleven, my piano teacher introduced it to me when I began to perform publicly” He has grown into it with grace and aplomb. The record continues on a high note with Nick’s light, sauntering version of “I Won’t Dance,” but changes tone for a tender and intimate take on Billy Joel’s “Summer, Highland Falls,” the 1970s ballad which fits comfortably into a collection of vintage standards. The bright and brassy Sammy Davis, Jr. staple “Too Close for Comfort” is given a distinct arrangement that brings out new colors in Nick’s voice. “Anyone Can Whistle,” from the Stephen Sondheim musical of the same name, is a personal favorite for Nick. “It’s always been a goal of mine to perform in a Broadway show,” he commented. “So I figured it would be fitting to include some great theater songs on my debut album.” His hushed, confessional interpretation demonstrates he has the acting chops to make that dream a reality. Recording “The Rainbow Connection” – Paul Williams and Kenny Ascher’s beloved Oscar-nominated theme from The Muppet Movie – was particularly special to Nick. “I grew up as a huge fan of The Muppets. I couldn’t believe it when I found out Nola is where Sesame Street recorded many of their songs.” Firth’s gently propulsive arrangement adds a pleasantly unexpected element to the iconic ballad. With its range of tone, tempo and theme, A Lot of Livin’ to Do is an ideal launching pad for this promising and original young vocalist, set to establish him as an important part of the next generation of great singers. Nick’s assured manner and uncanny aptitude to capture the emotional core of each song will give him further reach to entertain audiences around the globe in jazz clubs, the concert stage and top orchestras. The best, as they say, is yet to come. NICK ZIOBRO first launched his burgeoning career as the winner of the 2012 Great American Songbook High School Vocal Academy and Competition at age 15. The native of upstate New York spent a year serving as the Youth Ambassador of the Great American Songbook. He made his New York debut at Feinstein’s at the Regency onstage with Michael Feinstein, Barbara Cook and Marilyn Maye. Nick’s national tour with Feinstein included performances at the Pasadena Pops (sharing the stage with Marvin Hamlisch in the conductor/composer’s final performances), Benaroya Hall in Seattle, Davies Symphony Hall in San Francisco, The Nugget in Reno, the Napa Valley Opera House and the Cincinnati Pops Orchestra. He was called “a radiant presence” from Edge Los Angeles, “absolutely breathtaking” by the Carmel Current and “stunning” by the Napa Valley Register. Nick also performed at the inaugural induction gala for the Great American Songbook Hall of Fame alongside Barry Manilow, Andrea McArdle, Clay Aiken and Lari White. Other recent credits include the Syracuse Opera Company, Syracuse Symphony Orchestra, and CNY Jazz Orchestra. Recent highlights include performing at the Mabel Mercer Foundation’s Sammy Cahn Tribute at Jazz at Lincoln Center, ranking as a finalist in New York’s Noël Coward Foundation Award and singing the National Anthem at the Indianapolis Colts game. Nick also performed alongside jazz stars Hilary Kole, Eric Comstock and Laurel Massé for a special benefit for The Michael Feinstein Great American Songbook Initiative. Influenced by Frank Sinatra, Fred Astaire, and Louis Armstrong at an early age, he began singing and performing in the local choir and vocal jazz ensemble, in addition to working in theater and dance. For photos, video and appearance schedule, visit www.Nick-Ziobro.com. Follow him on Twitter @NickZiobro.